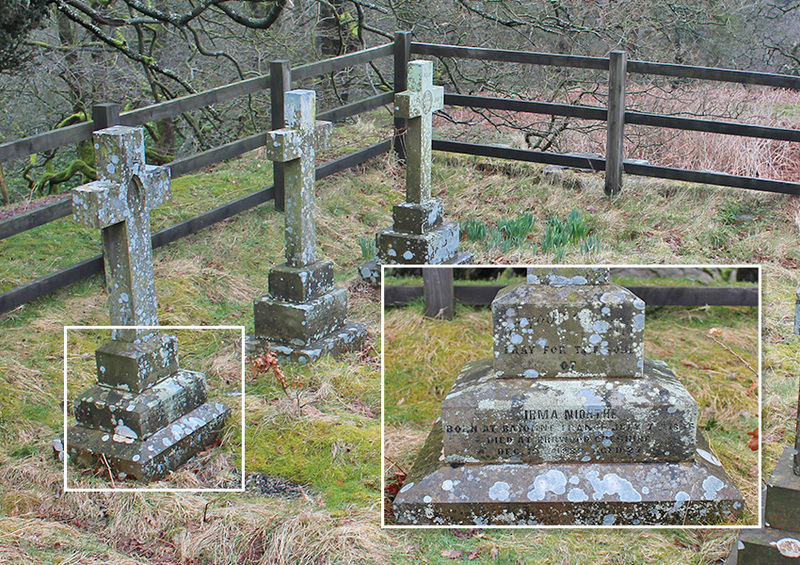 Above: I think these two ladies may have been servants at Errwood Hall, occupying a similar role to Irma. They both seem to be dressed in in funerial black. I wonder what the story is behind the photo. I would guess it would haver been taken around 1910 – some 30 years after Irma’s untimely death. My thanks to Rod for sending this story of his ghostly encounter by the River Goyt. And for the photographic evidence. On a very pleasant sunny day in late July 2017 I decided to go for a stroll in the Goyt Valley. I drove to the southern end of the Errwood Reservoir and parked in the car park close to Errwood Hall ruins. Little did I know that my wanderings that day would result in me experiencing a strange apparition. As a keen, but definitely amateur, photographer I had my camera with me and was hoping to locate a waterfall scene so that I could practice taking long exposure photographs. Those with an interest in photography would recognise that I was hoping to capture ‘the cotton wool effect’ which is a common technique used to photograph flowing water. Waterfalls and rapids can make excellent subjects for this effect so good examples of these were what I was hoping to find. As I had not explored that particular area before I decided to take the Riverside Walk leading off the road to Derbyshire Bridge to see if there were any interesting rapids or minor falls in the River Goyt that would be suitable. After a number of disappointing attempts to capture interesting flowing water scenes I walked on and came across a small tributary stream feeding into the Goyt from the right. 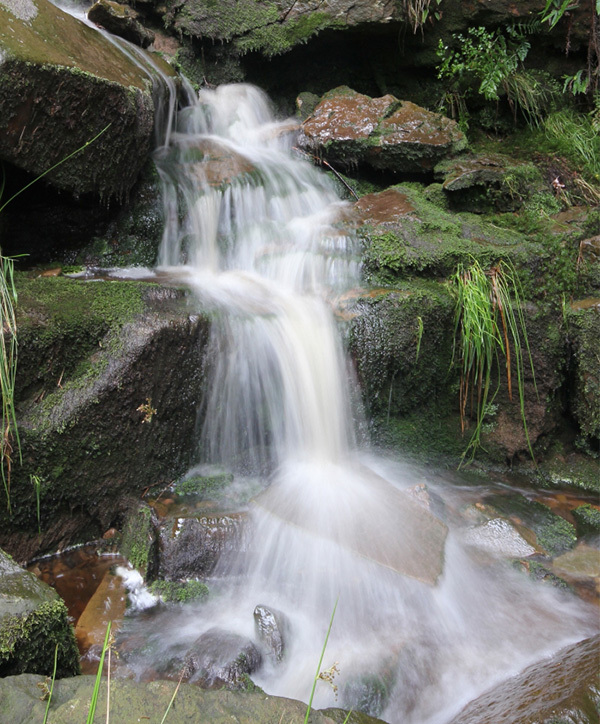 Due to fallen branches and uneven ground it was not easy to negotiate a path along the stream but I persevered and I was pleased I did as I came across a secluded cascade of water that gently tumbled over the bedrocks. It was a weekday so the area was quiet and I was left in peace to set up my tripod and try to capture a few mood shots from various vantage points. As the location was off the main path and heavily shaded by the surrounding trees the warm sun struggled to penetrate the canopy which meant there was a coolness in air. As a consequence, I felt a frequent shiver but sensed I had found a special place where a person could lose themselves in contemplation. After a half hour or so at this location – and being keen to see the resulting images on my laptop back at home – I decided to call it a day and made my way back to the car park. It was only in the evening when I checked through the day’s shots that I saw the strange image that had perhaps brought on the chill. As I went through the images one by one I came to my favoured shot of the tumbling water at the secluded spot and saw something that I had not seen at the site. What leapt out at me immediately was the figure of a woman dressed in a white bridal gown kneeling as if she was praying or reading at a table. A curious phenomenon I thought. Other than sharing the photo with a few friends and seeking their views on what they saw I did little else with it at the time. A few weeks later however I was randomly reading the goyt-valley.org.uk website when I came across a tale of ‘Ghostly Goings on at Errwood Hall’. The incident referred to had been experienced by a woman called Jen Cairns and was based on her seeing an apparition of a group of people seemingly transporting a coffin to the Grimshaw family graveyard. The Grimshaws had occupied Errwood Hall during the nineteenth century but at the time of the apparition in the late 1970s it lay in ruins. Jen speculated that the coffin had contained the body of one of the staff who had unfortunately died at a very young age – one Irma Niorthe. The limited information we have of Irma is that she died in 1882 at the age of 27 and It is believed that she was a Ladies Maid in the Grimshaw household. At the time of her death there were two Grimshaw daughters in the family, Mary and Genevieve. They were respectively 30 and 29 years old. It was likely therefore that Irma was the maid to one or both of these women for a number of years preceding her death. Irma’s gravestone in the family graveyard reveals that she had been born in Bayonne, southern France in 1855. It must have been a special privilege to be allocated a plot in the family graveyard so although she died very young she must have been highly regarded by, and close to, her employers. The Grimshaws were quite wealthy and liked to travel. The father Samuel had purchased an ocean-going yacht, The Mariquita, in or around 1870 and it appears they ventured as far as Asia on it. More commonly though they would travel to the near continent with southern France and Spain being two regular destinations. The family employed a number of Spanish and French staff over the years so it is likely that they were offered employment during the Grimshaw’s visits to their respective countries. Irma may well have been offered a job as a Ladies Maid to either or both of the Grimshaw daughters when the yacht docked at Bayonne or nearby Biarritz. To accept such a post with a foreign family at a young age Irma must have been a very brave and adventurous woman who was looking for an exciting challenge in her life or she was someone wanting to escape her existing life for some reason. Could it be that she had suffered a devastating relationship breakdown and the offer of the job came at a time when she was heartbroken and just wanted to get away? Could it be that she had been betrothed to someone who subsequently had a change of heart or had died leaving her in a state of despair? This is something we can only speculate about but it is clear that Irma took a big decision to leave her home country and move in with the Grimshaw’s. Working at the Hall she would have had little free time but in what time she had it is easy to imagine her going for solitary walks around the estate and finding secluded spots to reflect on her earlier life almost a thousand miles away in France. The small tributary to the river Goyt just off the Riverside path is only half a mile from the Hall. It is possible that Irma happened upon this place and found it to be a peaceful location where she could lose herself and where she could contemplate what might have been had her life followed a different path. Is it also possible that where a location has been the site of strong and deep emotion a trace image may linger for many years? If so, did I happen upon an apparition of Irma’s emotional reflections nearly 150 years after the event? If so, I hope she wasn’t disturbed and would ask others to respect her peace. Click here if you can’t see the ghostly bride and all will be revealed!